Swedish designer Richard Lindvall has converted a car park near Stockholm into a restaurant and nightclub with copper pipes stretching across its walls and ceiling. The restaurant serves Polish food, so Richard Lindvall visited a few factories in Poland to find inspiration for the project and came with a concept for an industrial interior filled with raw materials rather than soft furnishings. The designer left many of the concrete surfaces exposed inside the old car park, while others he lined with plain white ceramic tiles. "The natural raw atmosphere of the space was kept and used as a base for the concept," he says. Some of the copper pipes snake across walls to function as radiators, while others create a lighting framework overhead and more can be found as plumbing for sinks in the toilets. Copper is also used for the facade of a large fireplace. 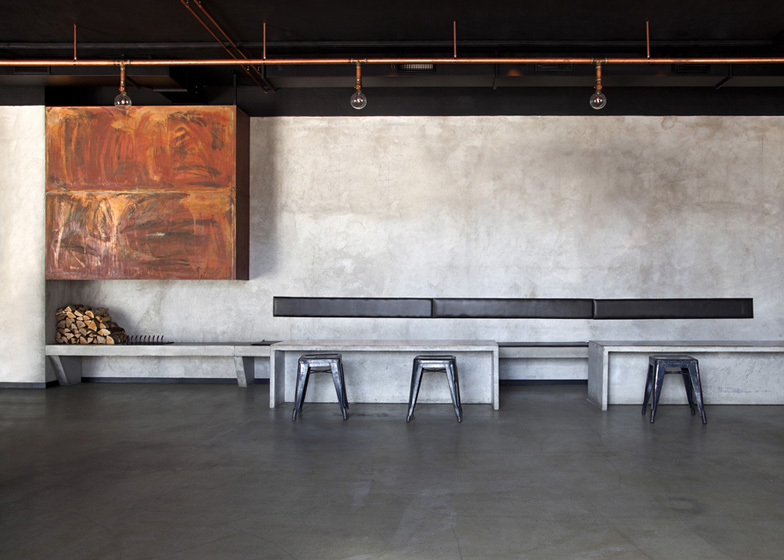 The bar is made from concrete, as are the shelves that span the walls behind it. Industrial lights hang from the ceiling, which the designer sourced from an old factory in the Czech Republic, and a hunting trophy is mounted to the wall. Metal stools surround concrete tables in the dining room. Other details in this space include framed photographs by Mattias Lindbäck of the construction workers who installed the interior. Other recently completed restaurant and bar interiors on Dezeen include a penthouse bar and nightclub in Paris with black trees inside and a bar in Vienna with a faceted ceiling of upside-down peaks.